Print: Lets you print the active document. Print Preview: Displays the document exactly as it will look when printed. Print Setup: Lets you specify a printer and change printer options from the standard Windows Print Setup dialog box. Open a window that supports printing. For example, open the View Local Logfile or View Product Table window. Click on a column within the window to activate the Print and Print Preview options. Note: In any window that supports printing, and prior to clicking on a cell within the window, Guardian offers the Print Setup option only. To add a printer, see the Add a Printer section or Windows Help. 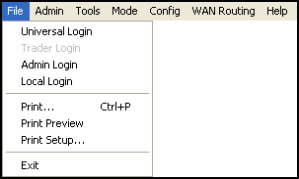 If you have a printer already set up, click in any cell within the window, and all print options will be enabled. Print a single page: Select a topic to display the information, and then click Print. Print an entire book: Select a book title from the Contents tab and click Print. Print all Help topics: Select a book title and click Print. Repeat this process for each of the remaining books. You must print each book separately.